Mix brownie min according to package directions. Add 1 can coconut pecan frosting mix and 1 cup sour cream to batter. mix well. spread in greased 9×13 baking dish. 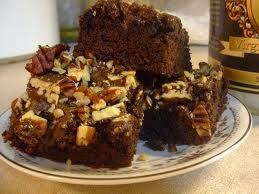 sprinkle with 1/2 cup crushed pecans and 1 cup mini chocoloate chips. bake at 350 degrees for 52-55 minutes. Rave reviews!